The overall experience is beyond imagination. This trip was my first time to Nepal. Trekking and exploring a small section of its beautiful landscape (the Annapurna circuit) from Besisahar to Pokhara. The overall experience was beyond my imagination, astonishing views of magnificent mountains with snow capped peaks, moss-laden rhododendron forests that seemed enchanted and farmed terraces. It’s difficult finding the appropriate adjectives to truly explain the grandeur of the views. Even the photos don’t show the depth and beauty of this Nepalese landscape. It wasn’t until we started the drive from Kathmandu (via the local highway) that I noticed, what I first thought were clouds in the sky but were snow covered mountains. I was awestruck by their size, reaching higher than the clouds. I could feel a small twinge of excitement come over me, “This is going to be one hell of trek”. As we walked, it was immediately evident that we were about to see the promised diversity written of our Nepalese trek, the Annapurna Circuit. We ascended along the Marsyangdi River Valley and passed beneath the snow-capped Annapurnas II, III and IV and a range of other 6,000m peaks. The highpoint of our trek, crossing the Thorong La pass (5416m) after a 3 hour very early morning walk from High Camp. It was -13°C at the top. After some loud cheering and photos, we headed down the other side to reach the holy shrine of Muktinath. We then descend into the mighty Kali Gandaki Valley (the deepest river valley on the face of the earth) 7000m deep between Dhaulagiri and Annapurna. The area was a vast windswept region under the shadows of those two mountains. This part of the trek took us across wasteland like landscapes, infertile ridges and windswept cliffs. At the end, we trekked through a wonderful rhododendron forest on the Gorepani Ridge and the picturesque Gurung villages before finishing back in the Pokhara Valley. Not only did we face a few massive ascents we also had some long days of trekking. In saying that, I look back and would have to admit, we only spent a couple of weeks in the mountains trekking. Our porters (Indra and Mohan) carried our heavy gear, locals fed us and provided rooms. Life is tough in the mountains, food is difficult to grow and the variety available at lower elevations simply cannot thrive at the heights above 4,000 metres. Provisions are driven to the villages where there are roads (not smooth roads) and where there are no roads all gear and food is transported by either donkey or pony trains or by the locals themselves. The local people were always friendly and the children were always happy. Up in the higher elevations we saw Yaks, Blue Sheep and down in the lower levels we even saw a few wild monkeys living on the cliffs. It has always been said that physical exercise can stimulate not only the body but the mind. Trekking in places like this amazing section of Nepal did that and more. The visual stimulation was never ending, every corner we turned it showed us more. I now understand this place would be unknown to everyday people with no interest in vacations spent trekking, just like me. I consider myself lucky to have been a part of our little foursome trekking group from Picton way. It was a once in a lifetime experience and way above my expectations. It made for a truly unique and rewarding adventure. I wanted to share with you all a brief story of where we’ve been. More details will come soon watch this space. It’s amazing how quick I was, in ringing the intrepid adventurous group from down Picton way, to see if I could tag along in them on the trek. It was a, “YES”. Susan, Alan, Anna and I, became a team of four. So much has happened since that day, planning and lists. This part of the trek has been quite uplifting for me. I have been able to concentrate on the journey and not the court case. Advanced Adventures – Annapurna Circuit Trek (21 day/s). Book the flights. We went with, China Southern Airlines. They have a good reputation, and with a great flight schedule and a short stop over. This suited us. Buy the appropriate clothing. It’s possible the temperature trekking over Thorong- La Top(5,416m) could be around minus 20 degrees. What can I say, I have never seen snow let alone been in temperatures like that. Bought all the gear now, boots, jackets, thermals (long johns), etc. I bought all my gear from the Sydney CBD Kathmandu store while they had winter specials on, nearly 50% off everything. This winter gear is not cheap and the layers you have to get. Certainly not the same as when I cycled from Darwin to Broome last year. Only one layer of clothing, but the temperatures were in the forties, a big difference. Nepal tourist Visa. Susan and I ventured into North Sydney to the Nepal Embassy and purchased the 30 day visas. We paid and extra $15 on top of the $85 for each of them, this guaranteed us completion the same day. It was worth it, not having them sent by mail or having to come back another day to collect them. Paid and all done. We can now enter the country without any problems. Vaccinations, which are a must travelling other parts of the world. We are lucky there is a Travel Doctor close to us all in Campbelltown. They have all the required vaccinations on hand. Very convenient. It’s quite expensive! Not a cheap visit to the doctor once you finally get all the ones required for Nepal. One example is the Rabies shots (3) were just over $300. Lists, How many can a person write? If it’s anything like my D2B (Darwin to Broome bicycle ride) it could be never ending. But it’s all worth it. As a group we have done some extreme adventures and are indeed very lucky to be experienced trekkers who no doubt are all very proficient list writers. Susan and Alan have MTB all over New Zealand. Anna has done the Mt Everest base camp trek and twice completed the Kokoda Track. 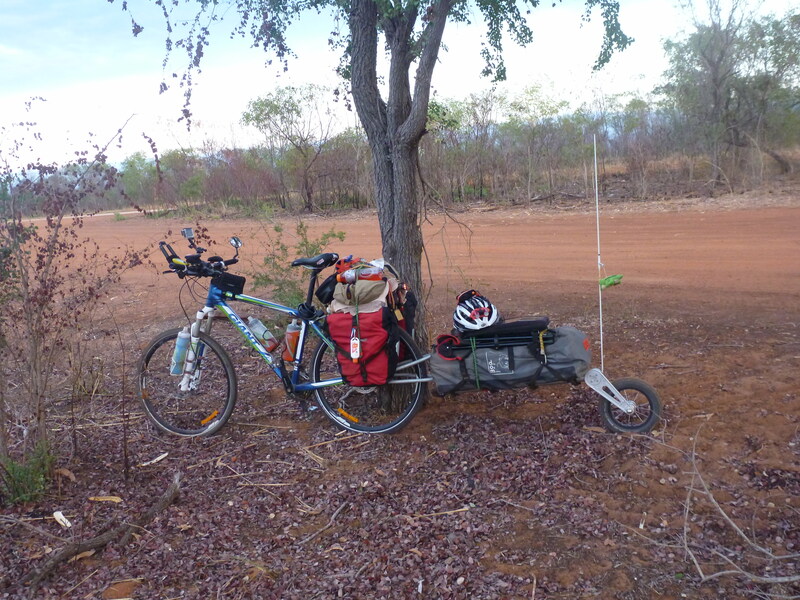 Myself, solo bicycle ride Darwin to Broome MTB. We train when we can, not easy when we all work and have different things on most weekends. 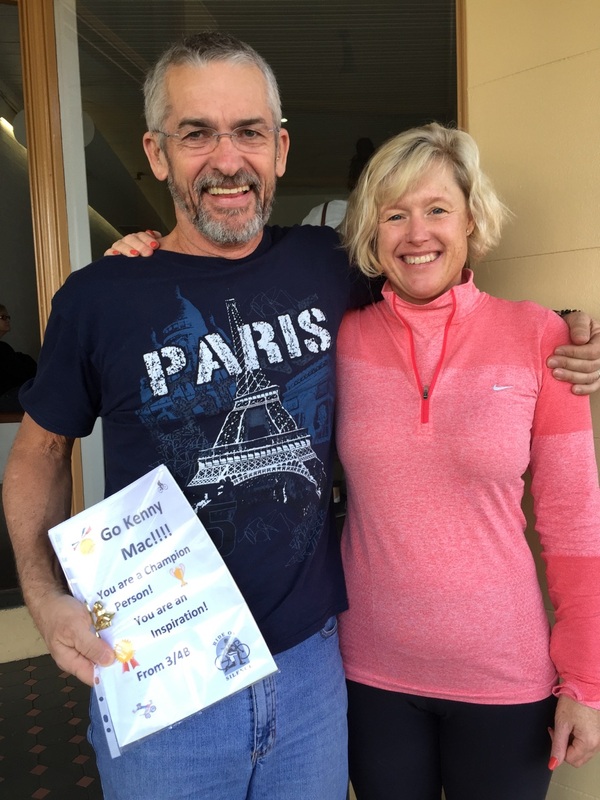 Susan and Alan have been out in their walking gear and have notched the most training kilometres. Anna has clocked up running and swimming kilometres and I have been keeping up my bicycle and swimming kilometres. All four of us are extremely fit – that’s just us and the lifestyle we choose to live. 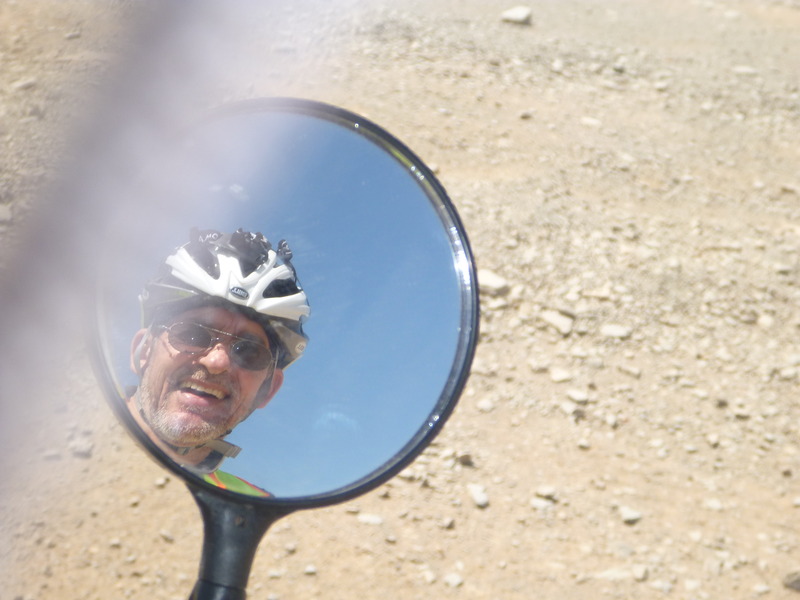 Now I must mention I’m the oldest at 61 and I was concerned about the altitude sickness and that I may not make the 5,416 metres to the top of the pass. What would any normal aged person do? Go and arrange altitude training with a personal trainer. I found a gym, Valley Fitness at St Marys Sydney, which is on the way home from work that has an Altitude Chamber for assessment and training. By the time we fly out, I will have completed about 24 sessions, 10 with the PT (Personal Trainer) to get me to 5,400 at 11% oxygen and the other 14 on my own. I feel more comfortable knowing that I have been doing this training. We head off on the 14th December, have two days just being tourist in Kathmandu and then start the trek with the tour group on the 16th December. So folks while I am experiencing my first white Christmas I hope you all have a lovely festive season. Watch this space and I will continue to share my Annapurna journey. It has been a little while since my last post. I have been flat out catching up on work since my last adventures and I have finally finished the last three events on my 2015 racing calendar. Highland Fling ½ MTB at Bundanoon NSW. I picked up my training after a few weeks rest from the Darwin to Broome. I was doing three swim squads and four rides a week. Of course no running, not allowed running, doctors’ orders. The two events (the Gong and the Highland Fling) would be included as a part of my training for the Ironman in Western Australia I have just completed. I enjoy training just as much as I love to compete in races. Nov 1st – Like I said , I have this thing about training and racing. OMG, I put the two together that day. Waking up at 2:45am was and wasn’t easy….you know what I mean. My day started with a ride, what I would call a training ride from Elderslie to St Peters (55kms). About eight of us from work met at the BP service station to ride the Sydney to Gong (90kms). A race that’s not really a race. I rode my MTB, the trusty “Northern Express” and kept with most of the guys on their racers. I did a P.B. 3:01:21. I then rode home up Mt Kiera (64kms). OMG it is steep and people complain about the two hills in the Gong ride. The elevation picture shows the difference. I must still be quite bike fit from the Darwin ride as I recovered really well. Nov 8th – The very next week end I ventured down to Bundanoon for the Highland Fling mountain bike race. I did the Half Fling (56kms), it truly is a mountain bike marathon race for all. It offers a scenic and challenging route through forests and farmland in the Southern Highlands of NSW, hammering single track, forest tracks, dirt road and less than 2km of blacktop. What a blast it was, a bit wet at times, a shower or two, but no significant rain, an absolute fun day. I beat last years’ time by 30 minutes. Now back into my last few training rides, ready for the Ironman. Nov 14th – My youngest daughter Angela is doing the Ironman Triathlon as well and we have been training together when we can. Ange came with me a couple of Saturday mornings to swim squad at Picton and we finish the afternoon off with 100+km ride. I remember one Saturday we swam 4kms in our wetsuits (good practice and to see if they still fit from last year) and went for a ride in the rain on the M7 bike path (twice) a total of 154kms. At one point the rain was so heavy that the track was flooded. Dec 3rd – Off to Busselton in Western Australia, we flew over to Perth, hired a car and headed down south to “Busso” (as they call it). What a beautiful place. Pity about the weather it was mostly overcast over the six days we had there. We wake up race morning and it’s bucketing down. The weather man said it should stop around 6:30 to 7:30. Funny, we’ll get wet in the swim leg, ha. Angela and I will handle it…..poor Andrew Gleeson (Angela’s partner) has to stand around supporting us in the rain. It was a tough day, but, a great day!, finishing the WA Ironman Triathlon with my youngest daughter Angela. The sea was angry, the winds were howling, it rained and at times there was some sunshine. We endured all that was thrown at us and finished across the line together. There was a moment when I had doubts whether my leg would get me to the end. With torn hamstrings I am only able to walk the marathon. Ange talked and talked and in no time we were at the finish shoot. It was a very special moment for me. This was Angela’s 2nd and my 6th Ironman Triathlon. Hey guys you have time to do one of these, I was 49 when I did my first one. 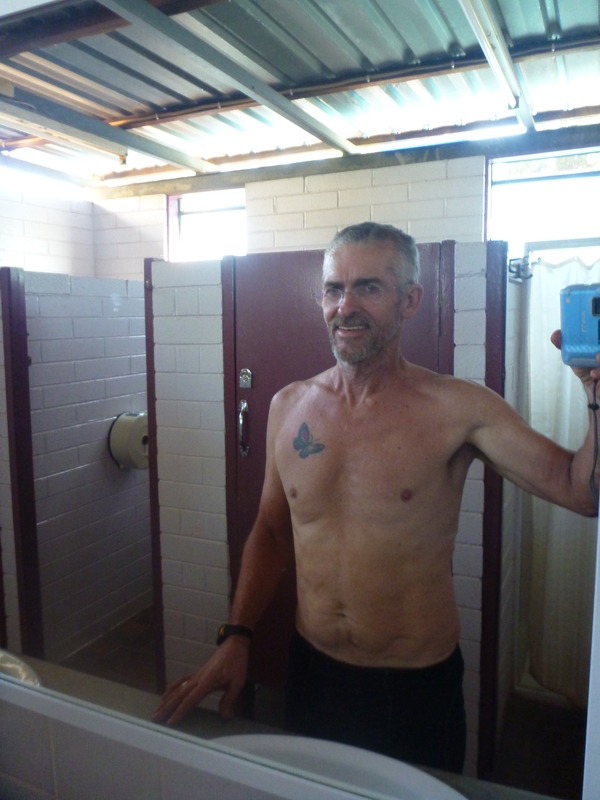 It has been a great year for me; riding Darwin to Broome and completing this race all at the young age of 60 and feeling quite fit. Enjoy your Christmas break, I surely will. 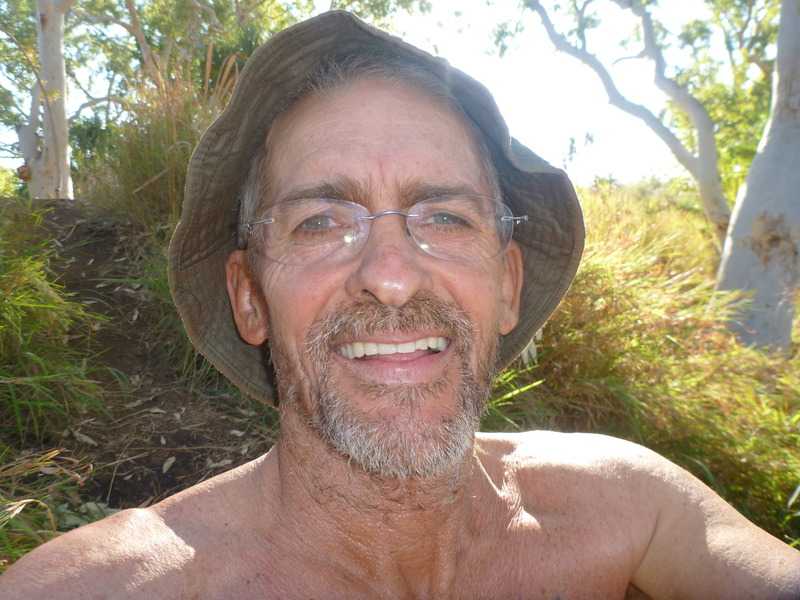 Yes……… I’ll still be swimming and riding over the break, riding to the top of Australia in January. It’s on my bucket list to climb to the top of Mt Kosciusko. Tell you about it in the new year. Hope you all had a very Merry Christmas and a big Happy New Year. Well…… I have been home now for 21 days. What a change from my makeshift beds and the red dust. Thought I might fill you in on the last two days ride into Broome. Those two days on the bike ‘Northern Express’ was a little different than any of the other sections I rode in the previous 19 days. Firstly because I knew it was only 222 kms to Broome and it would be bitumen all the way. The other difference was that I found I couldn’t go as fast as I thought I could. Still, I managed to average around 20 km/hr. On Wednesday morning I left just before sunrise, around 5:15, it was so nice riding in the cool of the morning. 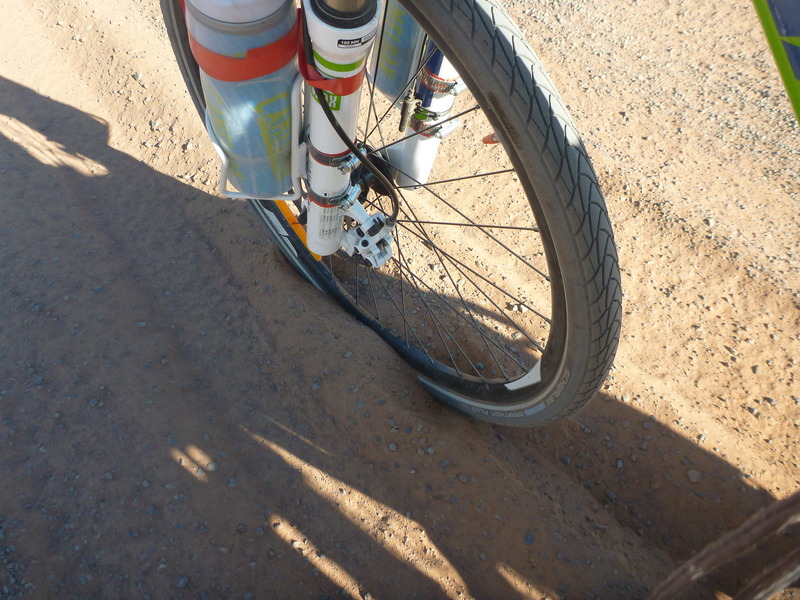 My original plan of riding the 187kms to Roebuck roadhouse changed, the new plan was to ride about half way to Broome stopping at the Nillibubbica Rest Area. I had been told by several caravan campers that it was a very good spot to stay overnight. With the new plan B in place I headed off to the Willare Roadhouse for breakfast. This breakfast meal midmorning was somewhat out of the ordinary for me on this trip so far. I was looking forward to having eggs on toast. While I was riding to Willare I was thinking to myself, “You know Kenny Mac you could do it, you could get to Roebucks Roadhouse, it’s only 187kms”. Then reality kicked in. I knew my body wasn’t up to doing that distance. Sitting at Willare eating, thinking this was the best breakfast I have ever had, poached eggs and grilled tomatoes on toast. I ate everything off my plate, not a morsel left. I got to the Nillibubbica Rest Stop around lunch time, a total of 113 kms for the day. I was exhausted my hands and fingers were numb (from the Gibb) and I figured there was no first prize for trying to get to Roebucks another 74kms. I set up camp in one of the concrete tables under one of the many awnings. I had decided to leave around 4:00am the next morning, that way I could have another breakfast at the Roebuck Roadhouse. So I didn’t erect my tent, I put my bedding under the concrete table and chair combo and slept right there. 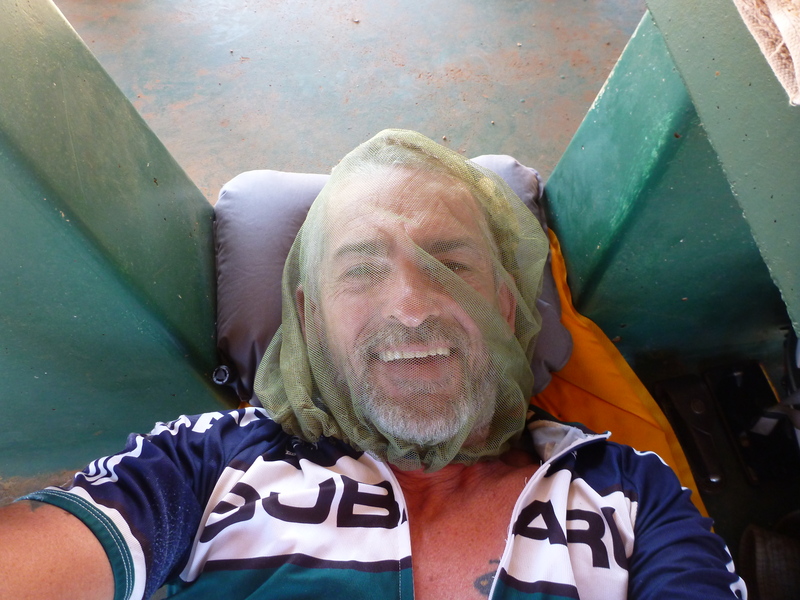 During my afternoon nanny nap wearing a ‘Mosquito Head Net’ to keep the flies off me, I was woken by a noise that was quite familiar to me. It was someone changing gears on a bike. I looked up and there was another crazy, as I call them, a young guy from France heading to Darwin had stopped in at Nillibubbica for the night as well. He was wearing jeans and long sleeve shirt and said that he should of worn summer clothes. Considering it was 41 degrees, I agreed with him. Now that I was awake I prepared my stove gear and cooked dinner. Wow, my last night and I had only the one meal left in my kit. 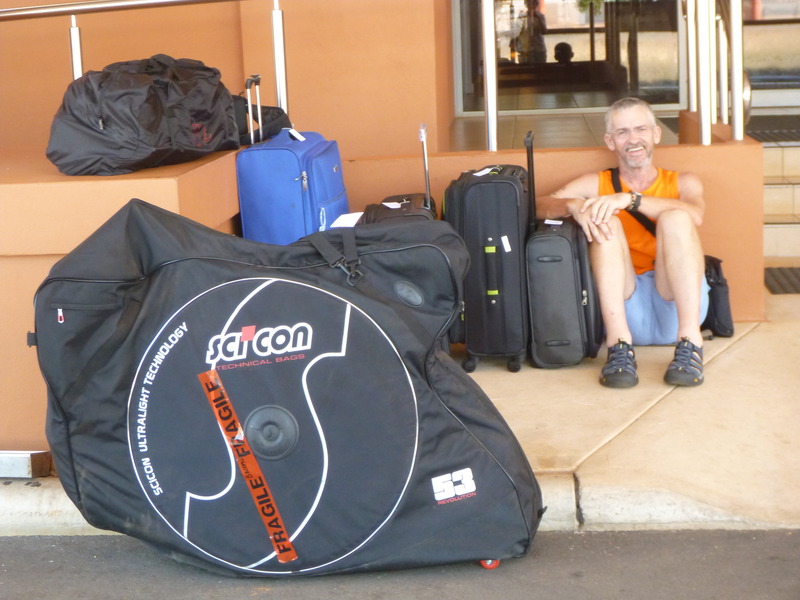 The trailer and gear weighed considerably less than when I left Kununurra. I started to get a little excited for the first time. I met some other campers at the Rest Stop and they were so intrigued with my bike and trailer set up. A big rig owner, Steve, gave me an ice cold litre bottle of lemon cordial to have with my dinner. He couldn’t believe how I drank so much hot water during the trip. This was it, my last day on the road, the final 109 kms. I was up at 2:45am, made some porridge and black coffee. I packed the last of the gear and rode out of the camp at exactly 4:00:04 and made my way in the dark but cool morning. I had 74kms ahead of me before another roadhouse breakfast. I decided I’d have the same as I did the day before at Willare. I could feel my speed was getting a little too fast and had to keep telling myself to, ‘just enjoy the ride and cruise along there is no hurry’. The reason I left so early was because I figured I would be at Roebucks Roadhouse around 8:00, a perfect time for breakfast, call Pam & Emily who were patiently sitting at Broome waiting. At one point I looked at my Garmin 810 speedo and noticed I had just completed 60kms and at the same time I heard a massive toot of a vehicles’ horn. It was Steve and Pam in the big rig passing by. I waved and then noticed he was pulling over to stop about a kilometre ahead of me. Well, to my amazement they were both out of the rig, Pam videoing me and Steve with another litre of ice cold cordial, lime this time. Couldn’t wipe the smile off my face, travellers all along this journey have been so generous. I only had 12kms left to reach the roadhouse and there was one mighty climb to tackle, ‘ha’ I thought, ‘just another one’. The climb to the roadhouse was very tough but I made it. I sat down in the dining room with my poached eggs and tomatoes on toast, and two small bottles of apple juice. Two days in a row, certainly was a change from those eight days on the Gibb River Road. 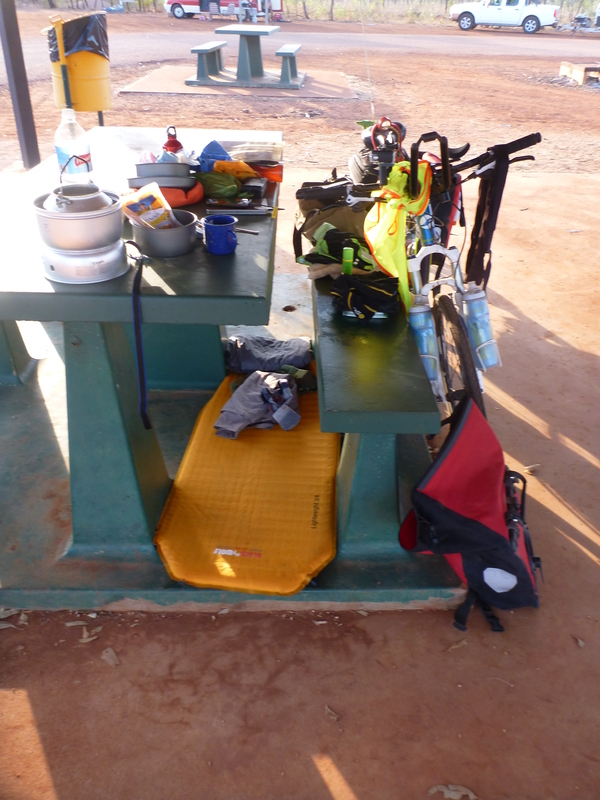 Rang Pam and Emily, said I was heading off at 8:30 and should be in Broome in about two hours. 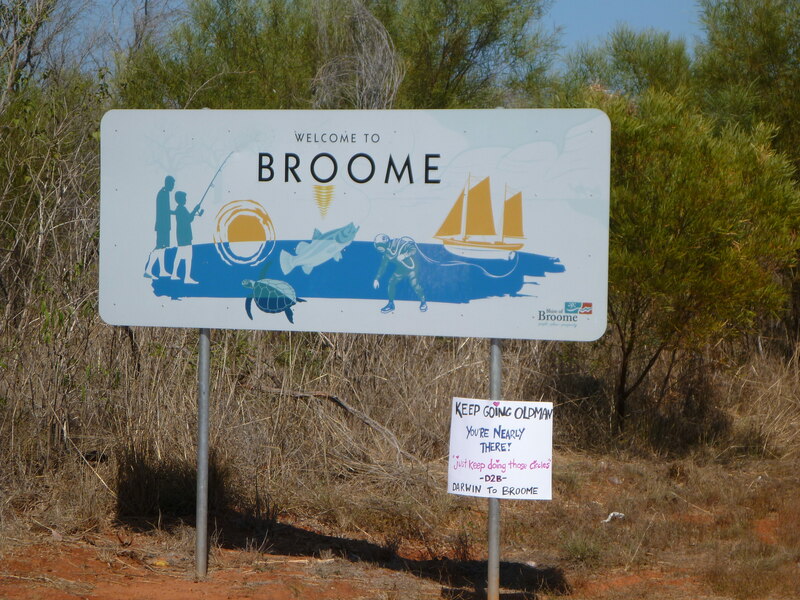 I said that when I see the ‘Welcome to Broome’ sign I would take a selfie (so good at those now) and ring them from there. It didn’t take long, I had just been cruising along, singing (glad no-one could hear it), and thinking out loud, ‘I did it, I bloody did it’. Before I knew it I was there, at the “Welcome’ sign, I looked at my speedo, still had 12kms to go. The sign was some way off the side of the road and there was quite a drop-off from the bitumen. I decided it was too risky this close to the finish to have any issues of falling off. I noticed a cardboard sign on one of the metal posts. My first though was, a “Soccer sign on ” or a “Netball sign on” poster. Then I saw the words ‘OLD MAN, it was for me, Emily always calls me old man. I laughed, and kept riding and laughed again. I laughed for about 3kms. 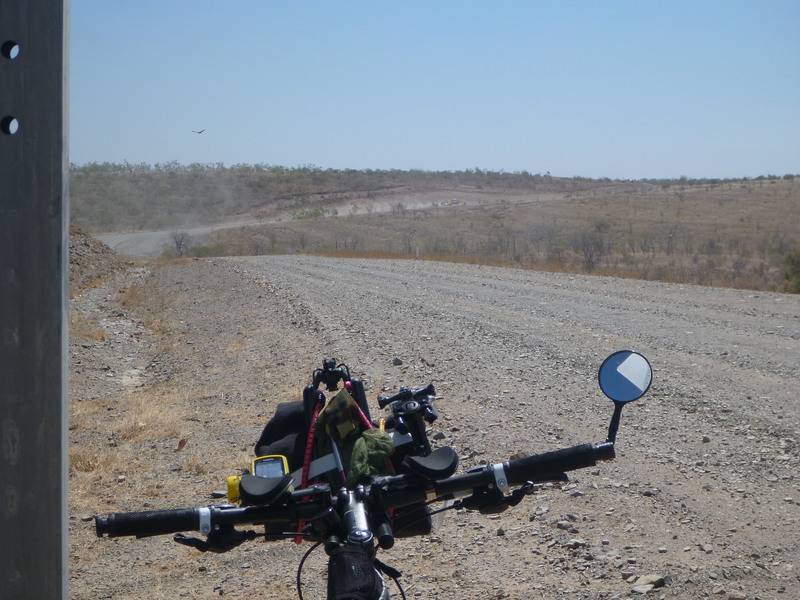 I was now 8km from Broome and noticed another rider on the other side of the road, OMG, could he be heading to Darwin. I crossed the road to say hello and chat, as us crazies do. 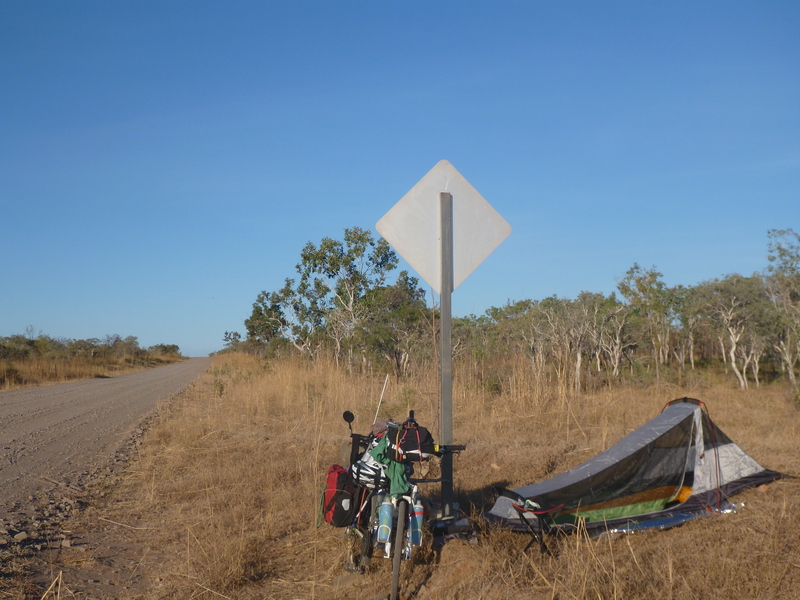 A young Japanese lad, Takuma was heading to Darwin via the Gibb River Road – he was only just starting his epic journey and I was just finishing. I said good bye to Takuma and wished him well. Now the funny bit! I found this out when I arrived at the Oaks Resort where Pam and Emily have been all week. Pam had a hire car and because they were getting a little concerned she headed off to see where I was. This is Pam’s words, “I was driving along looking for a rider and came to a road works section about 8km out of town and saw two riders on my side of the road, one tall guy with a beard and a shorter guy talking on the side of the road. As I passed them I noticed the bike trailer and thought, that’s Kenny Mac. OMG, I didn’t even recognise my husband”. Excitement was running through me, it was like electricity, I was so happy I made it. I headed down through the main street looking for Guy Street, I kept going then I could see the ocean. Oh no! Have I missed the street, I felt lost. Rode all this way and couldn’t figure out where I was. I asked two young ladies walking along the footpath if they knew where Guy Street was. Straight to their iPhones’, Google map and said three more blocks heading the same way. Don’t you love it. There it was the Oaks Resort and two ladies with signs waving in the air. Kenny Mac You Did It. I did two media interviews (Click here to view), showered, ate, drank, and enjoyed the company of my wife and daughter. I rang my other three daughters, Alanna, Elysse and Angela. 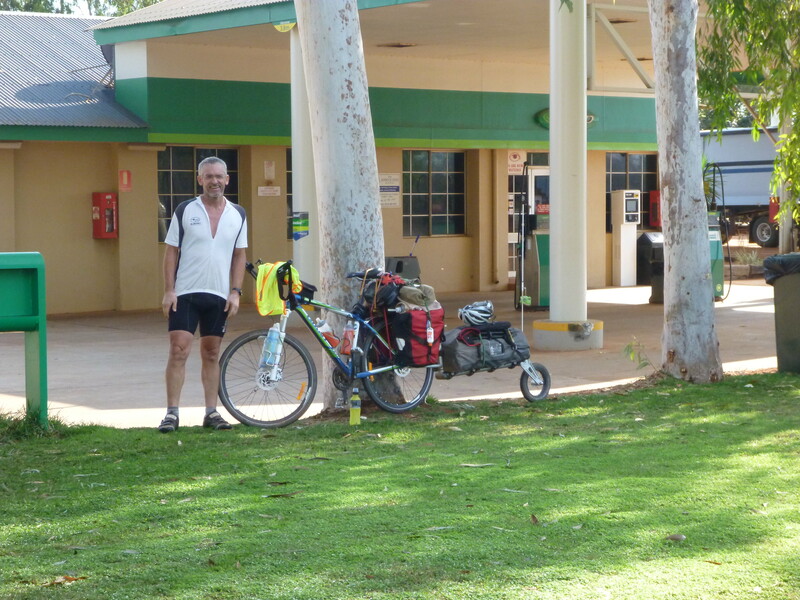 It was great to be in Broome after 21 days on the rode with ‘The Northern Express’. Today is White Balloon Day, a day where we send the message of awareness, prevention and support. Let us rally together and create a safer world for our kids and help other victims feel supported. I have been touched by the response that I have received since launching my Blog site and on my return home. I have been contacted by other survivors who have thanked me for sharing my story. It is not easy for people to share their own traumatic experiences. White Balloon Day to me is a day that promotes awareness and it makes you feel like you are not alone. One of the biggest things that make survivors hide their stories is that we feel alone and unsupported. That is the hardest part of any hidden story, to break through the feelings of being alone and thinking that no one will ever believe your story. You all know that I rode solo from Darwin to Broome on my mountain bike. It took me 21 days to complete the nearly 1900km. I not only did this for myself, fighting my demons, but I also did it to raise funds and awareness for Bravehearts White Balloon Day. This is a charity and cause that is very close to my heart. Follow the link and donate to this amazing cause. There were some extremely tough moments I endured on the Gibb River Road, none of which made me shed a tear. The tears came today, after swimming training this morning I was given a booklet from the youngsters of Goulburn Class 3-4 B. They have been reading my blog and watching my progress throughout the D2B journey. I was told they learnt lots from the readings; Geography (where I was in the Northern Territory and Western Australia), Maths (speed, averages and distances I travelled in a day), Health (my food and water), Writing (making the blog interesting-my job) and more. I would often read notes Lauren sent me, and some of the comments and questions were just great. Even just thinking of the class following my journey was so inspirational to me. During some of those wicked hours spent riding through the sand and corrugations I would think of all the youngsters in class, saying “you can do it, go Kenny Mac”. 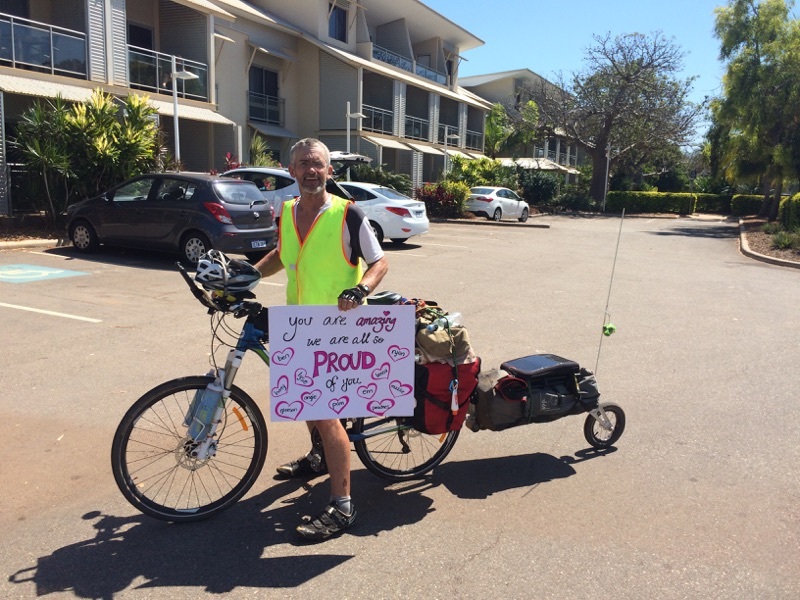 They gave me encouragement and they gave me three cheers when I reached Broome. If you can make a child feel good about themselves it’s wonderful. Making twenty four youngsters feel individually great about themselves, is a miracle. Best of all, these twenty four youngsters have made me feel special and for that I thank them, everyone one of them, I thank dearly. There is no way I could show just a couple of the pages from the booklet the youngsters made me, so I have put them all in the gallery for you to see. Each one of the pages was not only wonderful words but absolute works of art. 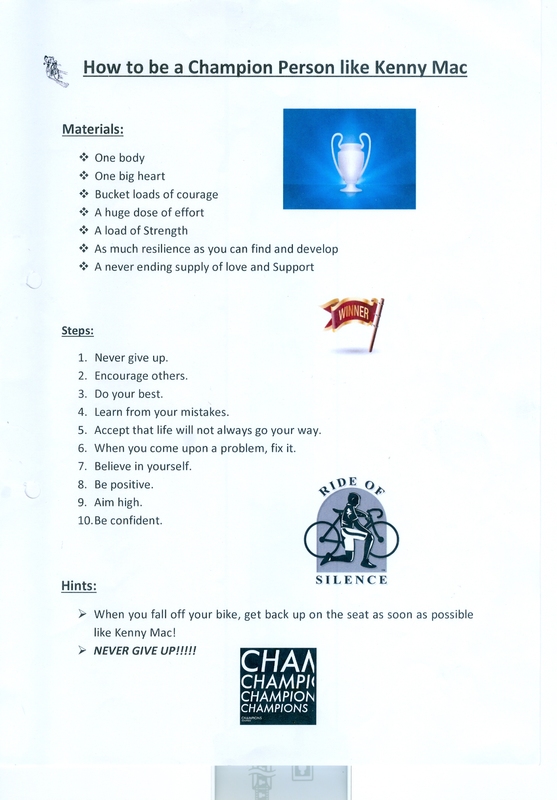 I thought I would give you all one more ‘Kenny Mac update’. Dad arrived home to Sydney last night and has been catching up on rest and relaxation. I have heard from my sources that he has been nodding off regularly and randomly (even at the dinner table) and has been constantly eating! We can all agree this rest and recoup is very well deserved. He will be back on the air in the next few days and will be keeping us all up to date on Kenny Mac himself. A huge thank-you Dad in trusting me to keep the ‘Kenny Mac updates’ on track. Can’t wait to see you in a few weeks. I have put some great photos from his last few days below. 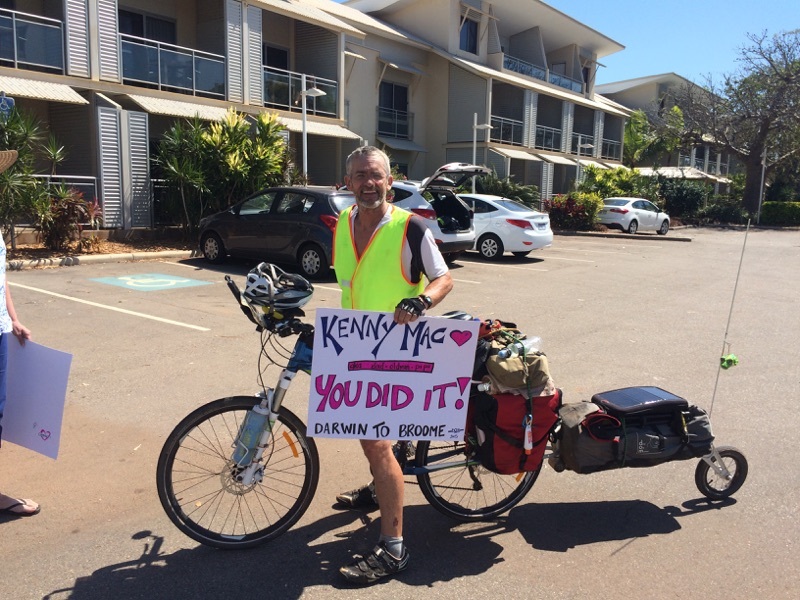 Kenny Mac – You did it! 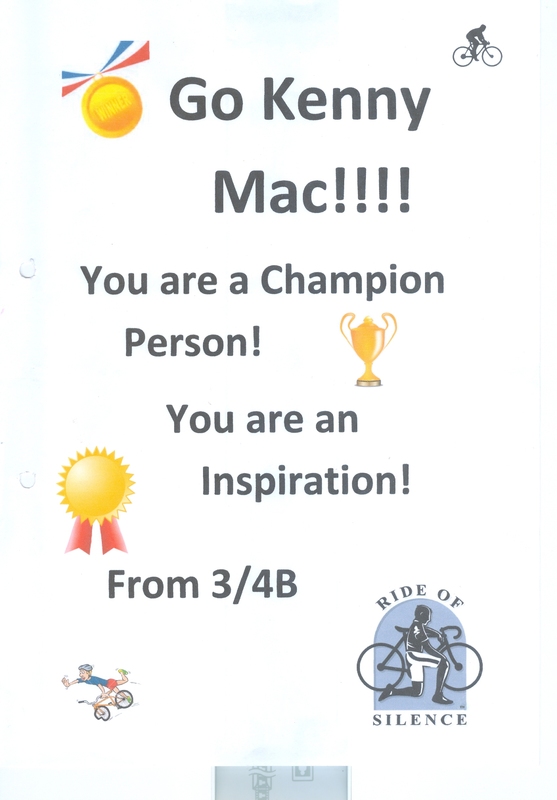 I have the best Kenny Mac update for you all…… HE DID IT!!! He has arrived safely in Broome. 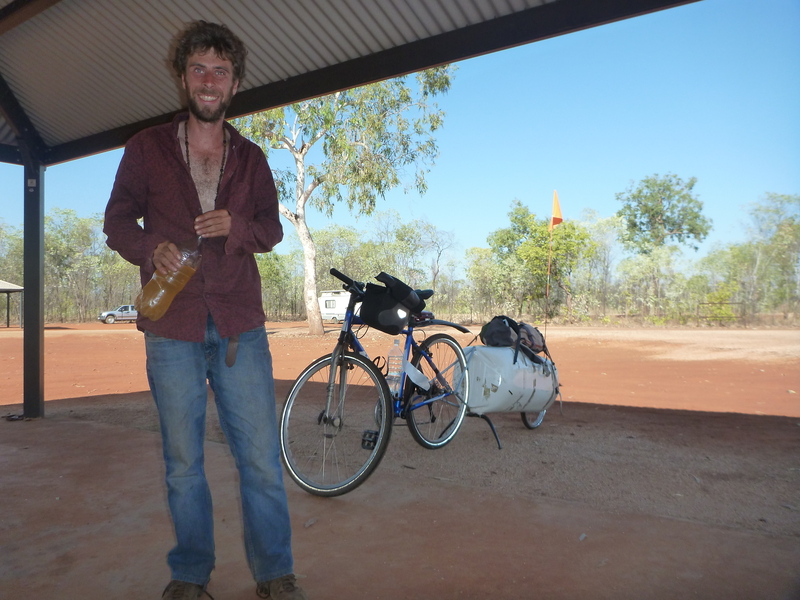 Approximately 1900 km in 21 days – We never doubted that he could do it – and he has. I speak on behalf of all my family in saying that we are so proud of you Dad, Pa Pa, Kenny Mac and we all can’t wait to give you a huge hug!!! It has been an exceptionally tough 8 days out on the Gibb River Road; the road that has broken many a vehicle and people. The last 3 days were, (I was nearly going to write ‘probably’) the toughest! The 300 km section of my ride between Mt Barnett and Derby was extraordinarily tougher than I ever thought and not just because of the continuous corrugated, rocky and sandy road. The soaring heat which made my water bottles hotter than the already hot tap water added to the tough conditions. Although I made sure I had enough water to last the 3 days and 2 nights ride. Carrying enough food for this section was not a problem. The problem was that it was difficult to eat in the heat, so lucky I had plenty in the larder, as they say. Knowing that there was at least 80 kms of bitumen into Derby and I would get some relief from the dirt road, I planned to do at least 90 plus kms on the first 2 days and 120 km to Derby on the 3rd. The first day was surprisingly hard on the legs with all the extra weight (water) I had to carry as there were no water stops. I managed to reach 97 kms (7:37:54 riding) and found a nice campsite. I had hit the wall big time that day; there were two big climbs over the range and the temperature got to 41 degrees. Did I mention: the flies would annoy by day and as soon as the sun goes down they go and the other ‘biters’ come out. There were ants, three different ones, so I would have to be careful where I set up camp, making sure I selected the right tree as ants often climb up them. 4 am: I got up; I ate breakfast and packed in the dark knowing I had another big day. An early start is my secret; I smash out 40 to 50 kms before it gets too hot, and my water stays cool. The day was the same as yesterday: corrugations, sand and rocks. Oh, did I mention that every time a vehicle went past I was covered in red dust. One WA couple stopped and gave me a cold bottle of water – it was amazing how much better you feel when your core temperature goes down! About an hour later another couple who gave me a bottle of cool water 2 days ago passed me another bottle as they drove slowly beside me (John & Wendy CH 40). I hit the wall again that afternoon! What a ride, 94 km (7:02:47 riding). I found a flat bit of dirt to set up camp and when I pulled up I noticed small droplets of water from my right pannier. I was devastated, two of my 1.5 litre bottles had split and I lost all the water! Some of my camping gear was also soaked. I unpacked all the gear and hung it up on a makeshift clothes line, so I could at least sleep on a dry bed. It dried quite quickly as it was 43 degrees today. I had dinner and half a cup of coffee and retired for a well needed sleep. The next morning came and I was ready to reach Derby. I was hoping for a break from the relentless roughness of the roads today. I had my porridge, although not feeling like much I knew I had to eat for the days ride. I drank another half a cup of coffee. I didn’t clean my teeth, knowing that they would soon be covered in red dust and I didn’t want to waste any water, knowing I must now ration out my water. It was a long day, hot, although only 40 degrees today. There was a small headwind, but it was so nice when I started to ride on the bitumen again. I was so tired and I noticed my pace was slowing considerably; I had to use lower and lower gears. Now that’s a sign of hitting the WALL! Every 10 kms I would stop and drink the amount of water I had allocated for my rations. This would make the kms go easier for me. I looked in my little side mirror at myself and smiled. Two days off; eat, drink and be merry. My hotel for the night – on the side of the road.